•	Rivers, flats, channels and more are all in play for this hosted trip. With the sheer amount of fishing options there’s an abundance of species like permit, tarpon, bonefish and snook. •	Perfect destination for smaller groups, Belize River Lodge will entice all anglers of any skill level. •	The lodge also offers incredible ecoadventure tours on the mainland. Belize River Lodge: is a tried-andproven, world–class fishing lodge set in tropical greenery and colorful flowers. This is a perfect choice for a serious fishing expedition. In addition to the outstanding fishing program, non-fishing or semi-anglers can enjoy many eco-adventure tours (both ½ and full days) throughout the mainland such as the Mayan Ruins, canoeing, the Belize Zoo, and zip-lining courses, to name a few. Snorkeling and leisurely boat tours are also available. Depart from your hometown enroute to Belize. There are many convenient flight options from the U.S. to Belize City (through several gateway cities). 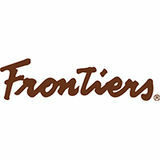 Frontiers would be happy to assist with any air arrangements. Upon arrival at the Belize International Airport you will be met by a lodge representative and transferred to Belize River Lodge (10 minute drive). After check-in, enjoy the remainder of the day at leisure. Dinner and overnight accommodations are included. Breakfast will be served daily at the lodge for the duration of your stay. Over the next six days, you will experience guided fishing for large migratory tarpon in the rivers and flats, in addition to permit, bonefish and snook. Enjoy dinner and overnight accommodations at Belize River Lodge. After breakfast you will be transferred to the Belize International Airport for your return flight home. We encourage guests to bring nonfishing companions to Belize River Lodge. There are a myriad of activities for companions to enjoy while you are on the water fishing such as birdwatching, visiting Mayan Ruins, zip lining, cave tubing, snorkeling, visiting the Belize Zoo, and tours of the Belize Market District — just to name a few. Contact a member of the Frontiers Gear Team, they will draw on thousands of hours in the field to recommend exactly what you need and what you don’t. Whether you have questions about how and what to pack, looking for a new fly rod and reel or need a pair of great binoculars – we’re happy to help. Trip Cost: $4,375* per person based on shared accommodations / shared guide. Single accommodations / single guide: $5,832*. Rates subject to change. Nonfishing rates quoted upon request. Inclusions: Round trip airport transfers in Belize - meeting & checkout services, accommodations, air conditioning in rooms, daily housekeeping, all meals including a box lunch, soda & drinking water, guided fishing, skiff & fuel, Belize taxes of 9% hotel tax & 12.5% GST tax. 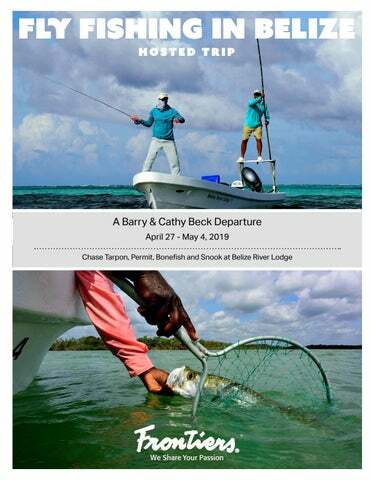 Exclusions: International airfare to & from Belize, fishing equipment & tackle, Belize Fishing License (US$55.50 per week, per angler and can be purchased at the lodge), alcoholic beverages, tips to guides and staff, Belize Departure Tax (approximately US$39.75 per person – included in ticket or paid at airport).